Biotech billionaire Dr. Patrick Soon-Shiong, 63, is the highest paid CEO in the U.S., according to Bloomberg's Pay Index for 2015. He leads the media company's annual index by more than $170 million. Soon-Shiong, founder and CEO of NantKWest in Culver City, Calif., received a $329.7 million pay package after the cancer-research company went public in July. It has a market value of $715.5 million, Bloomberg reports. 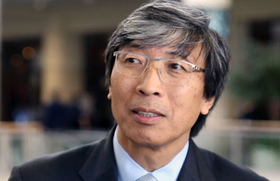 Soon-Shiong, a physician and scientist, developed Abraxane, a drug that treats lung, pancreatic and breast cancers. He founded and sold for billions of dollars two pharmaceutical companies, American Pharmaceutical Partners and Abraxis BioScience. He leads the Cancer Moonshot 2020 program, a coalition focused on immunotherapy and partnerships to find a cure for cancer. Trailing second on Bloomberg's list is investment banker Paul Taubman. He received $164 million after PJT Partners went public in October. Third is Google Inc. CEO Sundar Pichai, who received $151.9 million when he was appointed to run Alphabet Inc., the search engine's parent company.